By keeping track of latest market development, we are actively engaged in offering superior quality range of Garment Cabinet. The offered cabinet is designed in a way to prevent the deposit of dust and other particles on the garments when not in use. The product comes with a blower and a HEPA filter that maintain the vertical flow of particle free air which prevents the build-up of dust. Our experts check these cabinets on several quality measures which are in adherence with the set industry standards. 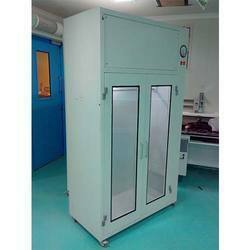 Looking for Garment Cabinet ?